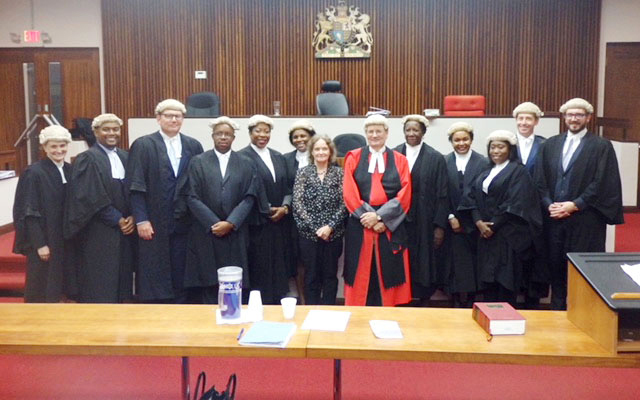 Alastair Malcolm QC was recently honoured at a Grand Court session by Cayman Islands Director of Public Prosecutions Cheryll Richards to mark his retirement as an acting Grand Court Judge. Addressing a busy court, Ms Richards said the announcement of his retirement had been met with “keen disappointment that he would no longer be on the bench”, going on to state that “we hoped that someone had got the date wrong” and continued to say “that sentiment was indicative of the high regard in which he was held”. Alastair Malcolm QC practiced as visiting lead counsel advocate at the Cayman Bar since for nearly thirteen years, dealing with some of the largest and most high profile matters in Cayman legal history: the most famous being one of the largest money laundering trials in the Cayman Islands (Cash4Titles, 2004). As an acting Judge since 2012, he tried the 2012 Cayman National Bank Robbery trial (the largest in local history) and was the first judge to pass a murder sentence under Cayman’s new conditional release law. Justice Malcolm thanked everyone in the justice system that had been so helpful and made him feel so welcome. He also thanked the people working in administration and singled out Suzanne Livingston, personal assistant to Justice Charles Quin, saying she kept the system working smoothly. He joked that one of Ms. Livingston’s last acts on his behalf was to smuggle his wife into the courtroom so that she could witness the farewell session. He said they will miss Cayman and would not be able to come from the U.K. as often as in the past, “but it will be on our itinerary,” he promised.